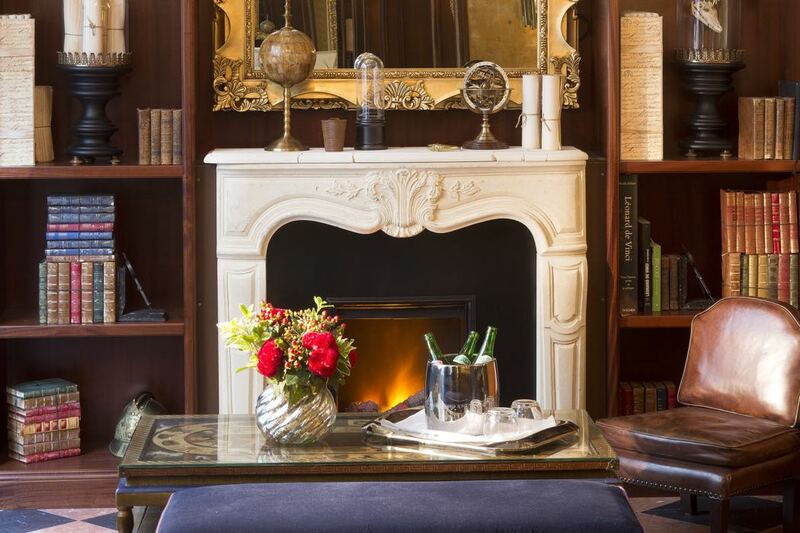 Small Luxury Hotels in Paris can be very special. Pick one of the best ones and your romantic stay will be so much more memorable. Be it walks along the River Seine, shopping on the Champs Élysées, admiring art at the Louvre or kissing at the top of the Eiffel Tower, with Valentines not far away, you have the perfect excuse to take that trip to Paris. 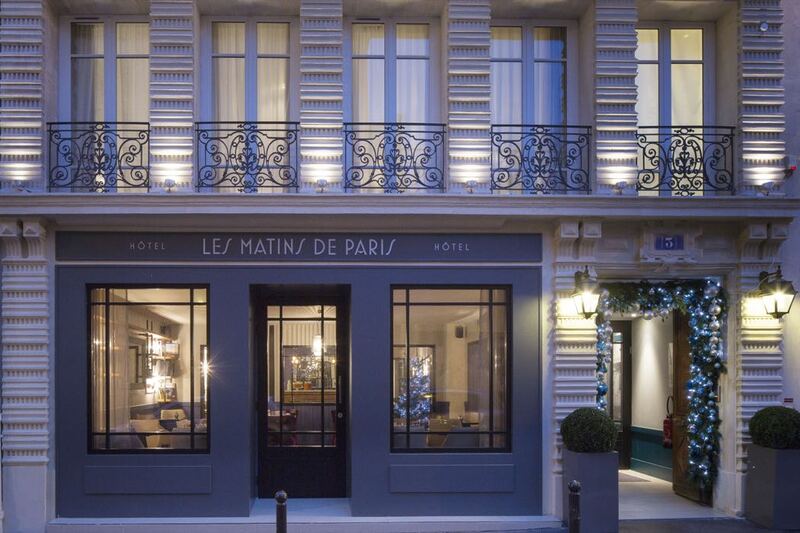 In this article I have picked out some of the best small luxury hotels in Paris. Each one is individual and the best in it’s class and I would love to share my finds with you. Does sleeping in a room containing an an unfinished work that might just be the famous Gioconda, by Leonardo da Vinci, appeal? Then the Hôtel Da Vinci is the small luxury hotel to pick. 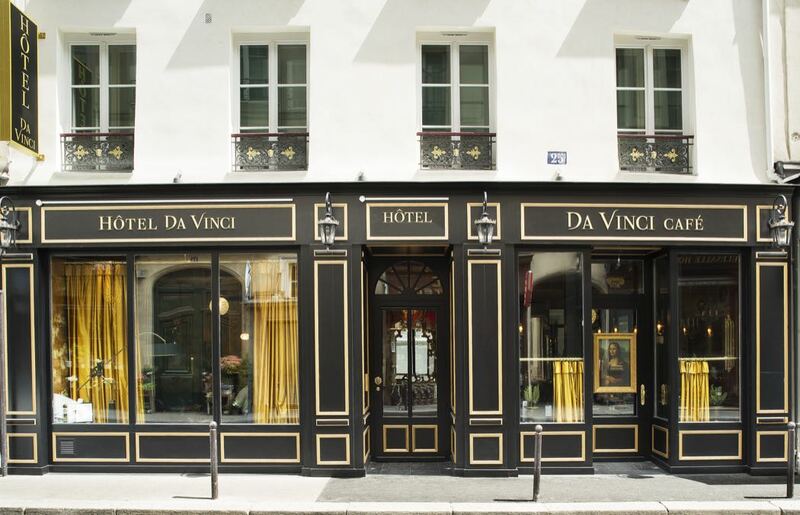 Located conveniently on the Left Bank, near the Louvre and Saint-Germain-des-Prés, take a journey into the heart of the Renaissance with Leonardo da Vinci who forms the basis of the decoration throughout the hotel. The Mona Lisa was hidden in this very building for three nights in 1911 after it had been stolen from the Louvre. 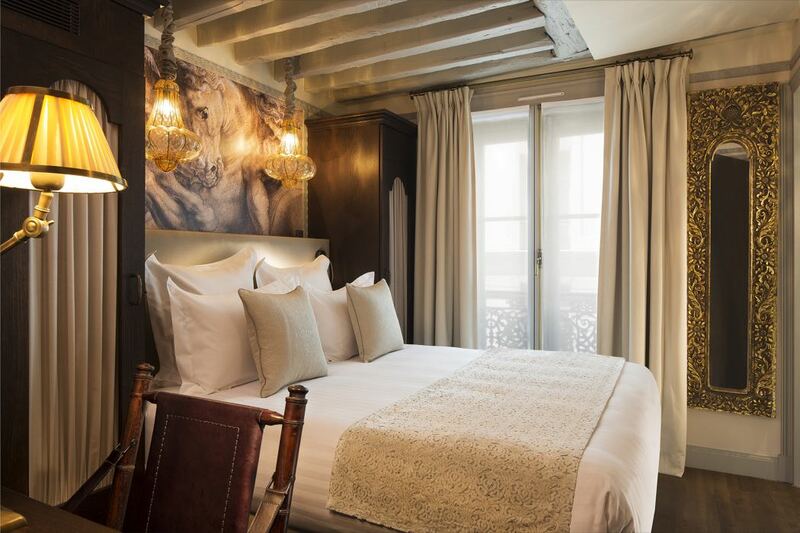 Located in heart of Paris’s wonderful Marais quarter, the five-star Hotel Dupond-Smith is the height of luxury and style and just a 5 minute walk from the metro, 10 minutes from Notre Dame, 20 minutes from the River Seine and a scenic 1 hour stroll to the Eiffel Tower. Eight rooms are split into three types. Alias (their luxury version of a standard room), Incognito (a more superior style room) and finally Intuitu (beautifully designed and decorated private suites). The Alias rooms offer a generous 20sqm of lounging capacity with a king-size or twin single beds, ergonomic desk, wardrobe, bathroom with rain shower and one even has its own little balcony! The larger Incognito rooms are either hidden away in the eaves of this enchanting building or are lower down with small private terraces to take in the fresh air and watch the world go by. Finally, the 30+sqm Intuitu Private Suites, some with private balcony, include more extravagant design features like an entrance alcove, dressing room, bar and lounge area, in addition to a separate luxurious bedroom area and bathroom with bath and rain shower. All rooms benefit from air-conditioning, flat-screen satellite TV, complimentary wifi, safe, your own personal espresso coffee machine, a selection of Kusmi teas and herbal teas, minibar, iPod Station, bathrobes, slippers and last but by no means least – toiletries from the gorgeous Parisian Perfume House: Diptyque. Beds are deliciously comfy and in spite of being right in the middle of busy Marais, you won’t hear a thing from the street as the windows are double glazed. Although there is no restaurant or bar in the hotel, you are just a short stroll from some amazing Parisian cafes, bistros, bars and restaurants. The Hotel does offer an excellent breakfast that can be served in your room or can be taken in the ground-floor lobby and it is available all day long. Prices start at 323€ per night. 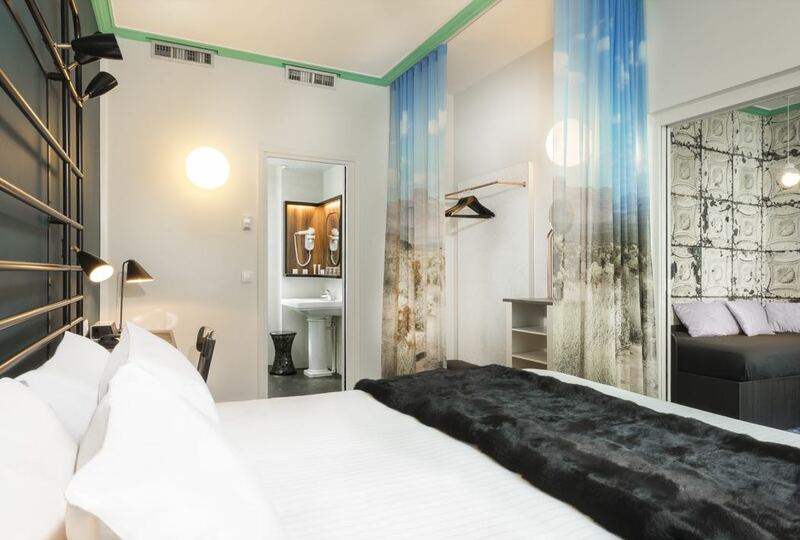 This contemporary four-star boutique hotel and centrally located luxury hotel can be found between Montmartre and Opera. Here, quintessential Parisian style mixes with contemporary design and quirky charm. Fantastical candelabras and exciting artwork can be found in every corner, exhibited on rich carpeting and lit by magnificent lighting structures. The 66 rooms and suites are simple, yet stylish with comfy beds, iPod dock, LED TV with 64 multilingual channels, wifi, air conditioning and complimentary mineral water. Superior Rooms offer added luxury and their own private (40m²) terrace. Deluxe Rooms are the most spacious and luxurious of all and also offer an Nespresso coffee machine. Eugine’s Cantine offers a contemporary atmosphere, quirky wooden seating and hearty meals like steak tartar and sharing plates including charcuteries, french cheeses and smoked salmon. There are plenty of local bars, restaurants and bistros nearby. Dine in the Montmartre or for a more local gastro experience head to SoPi (South of Pigalle), to enjoy Parisien culinary delights. Prices start at 261€ per night. 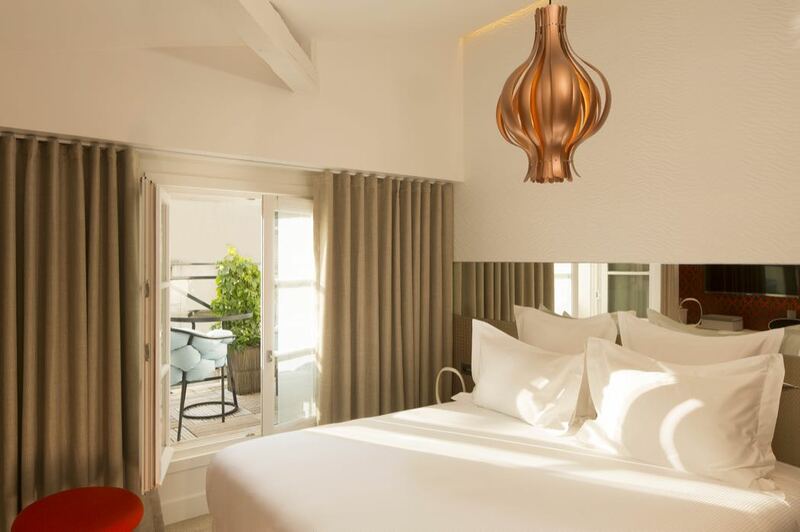 Perfectly located on the right bank of the Seine, between the Louvre and the rue St-Honoré fashion district, this four star boutique hotel offers 28 striking rooms designed to encapsulate the stone, concrete, wood and zinc roofs of Paris. The 5th floor suites, decorated by Hermès, offer hand crafted leather furnishings, and balconies with views to the pretty Tuileries gardens at the end of the street. The Cabaret and Opéra suites are inspired by the Moulin Rouge and Opéra Garnier. The mezzanine lounge has a 50’s look and has an honesty bar so that you can help yourself to drinks and snacks. 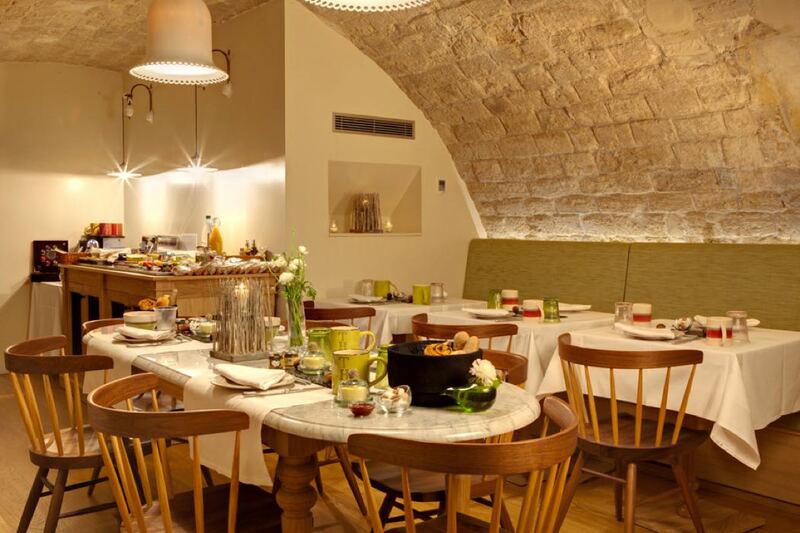 Enjoy their tasty continental breakfast in the vaulted cellar or grab a coffee, juice and croissant up on the mezzanine. If all the sightseeing gets too much, relax in the pretty Tuileries Gardens just down the street from the hotel. Prices start at 219€ per night. In the centre of Montmartre, Hotel Le Chat Noir sits in a building that once housed a famous 1920s cabaret of the same name. 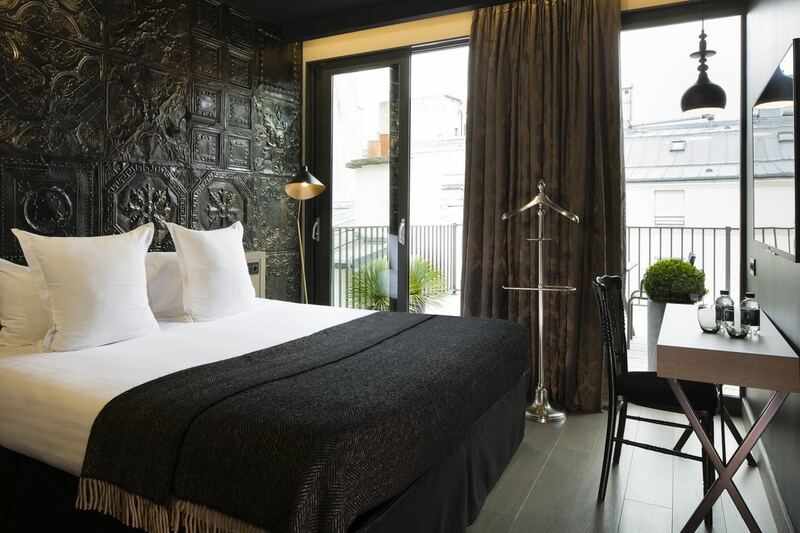 With a TripAdvisor Certificate of Excellence, Le Chat Noir Design Hotel comes highly recommended. It is located just 1-minute walk from the Blanche metro station and 2 minutes by foot from the Moulin Rouge, this hotel is ideally positioned to take advantage of the buzzing cafes around the Sacré-Cœur, or browse the historic antique-shops at the Marche aux Puces de Clignancourt – the largest antiques market in the world. Le Chat Noir has interior décor that is inspired by the style of the Moulin Rouge. The iconic red and black motif has been extended throughout the entire interior, giving the hotel a completely unique finish. Sleek rooms are also decorated in red, white and black, some with private balconies or Eiffel Tower views. The breakfast buffet of the pastries, cheese, charcuterie and fruit washed down with a fresh coffee is the perfect way to start your day in the romantic city of Paris. Prices start at 150€ per night. 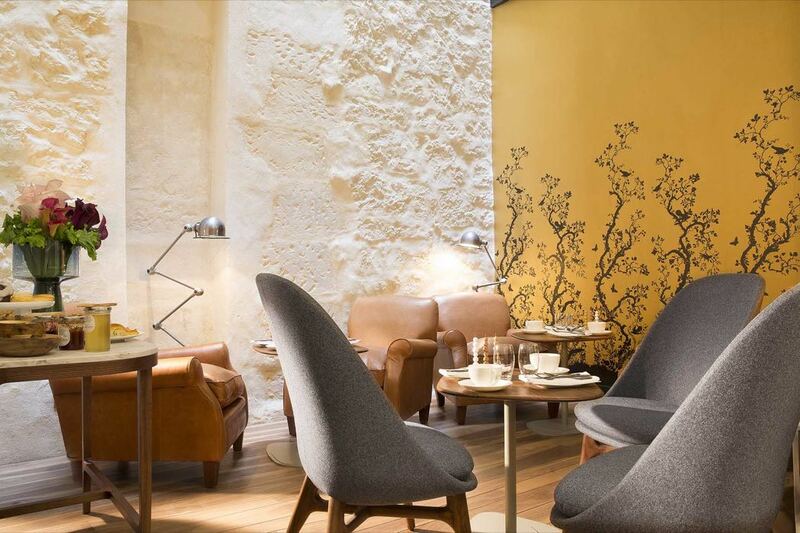 This cosy 4 star boutique hotel is located in the 9th Arrondissement,, near the famous Moulin Rouge and a few minutes walk from Montmartre and the Sacred Heart (which you can actually see from the balcony of of the Deluxe rooms). The hotel is also just a 15-minute walk from Galeries Lafayette for shopping and the Paris Opera. In the immediate vicinity you will find peaceful backroads packed full of small, cutsey shops. The hotel features an indoor pool, a bar/lounge, and a spa tub are available along with free WiFi. Other amenities include a steam room, coffee/tea in a common area, and a meeting room. All 33 rooms feature thoughtful touches like bathrobes and slippers and LED TVs with satellite channels, along with minibars, premium bedding, and rainfall showers. 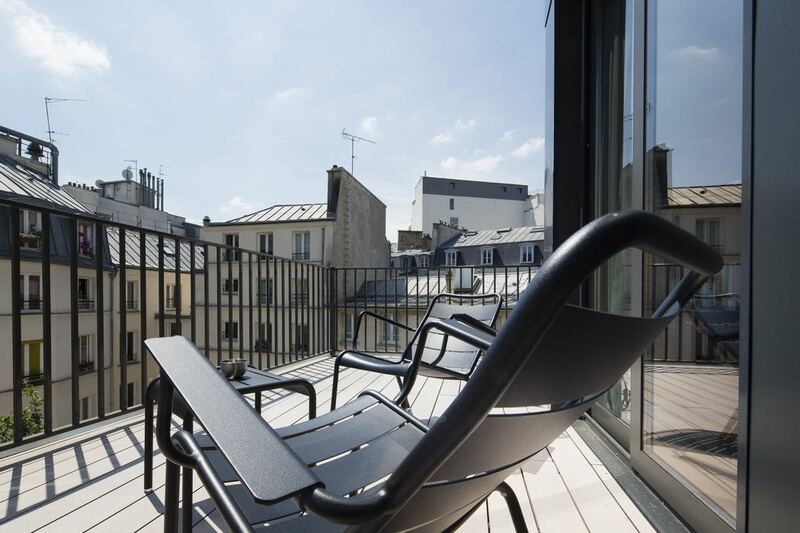 Hôtel Les Matins de Paris is the ideal location for a walking tour of Paris and if your legs wear out, you are close to three metro lines and bus stops. Some of these hotels also feature in my best boutique hotels in Paris article. You can also read my other top five best articles to discover the best beaches and luxury hotels around the world.